Seatpost clamp got threaded so had to improvise with a new bolt. See pic. One side of the clamp is bending. Cycle PS said it's not gonna cause the bike to fall apart whilst you're using it. I bought for £280 so I knocked £80 off due to this. Headset could do with replacing. I'd characterise it as low budget cruise control in that it bumps when turning through centre/doesn't turn smooth. You get used to it though, having commuted with it. Was like this when I bought it. Tiny bit of horizontal movement in hub of front wheel, but you really have to look for it. Guy in shop said he didn't notice it till he tried hard to find it. Again, there when I purchased, just mentioning everything I can think of. Have stuck a pair of pedals on to go. Overall a fun bike and could be much better with not a lot of effort. Let me know if I've mispriced. Still available? Looks like it's seen better days but I'd take it off your hands for 100£? already a great bike, would be perfect with a few changes. Hi mate- is this still available? Bargain build, gotta be a clown offering £100. GLWS. Free bump. This look suspiciously like a frame i had and sold on here. Did you get it from @elliottmiller who my records show bought it from me in 2016. He sold after having an accident anc not being able to ride or some such. Its amazing how things go round on this forum. Anyway, its a very longwinded way to say, have a free bump. 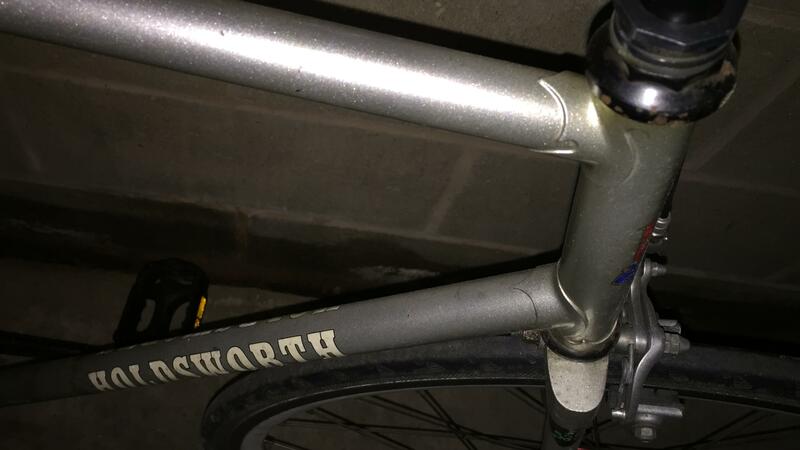 That may be that bike- can't remember names but it had silver mudguards and drops when originally purchased?